August is here, the last month of summer conventions. There are quite a few fan events for anime, manga, and Japanese culture appreciation scheduled for this month. If you’re an anthropomorphics fan there are two conventions the August 12 weekend. Right after Comic-Con we posted a round of cosplayer photos. 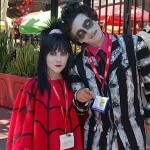 We’ve had a chance to sift through more of our SDCC 2011 photos and now bring you Round 2 of cosplay from this year’s Con.